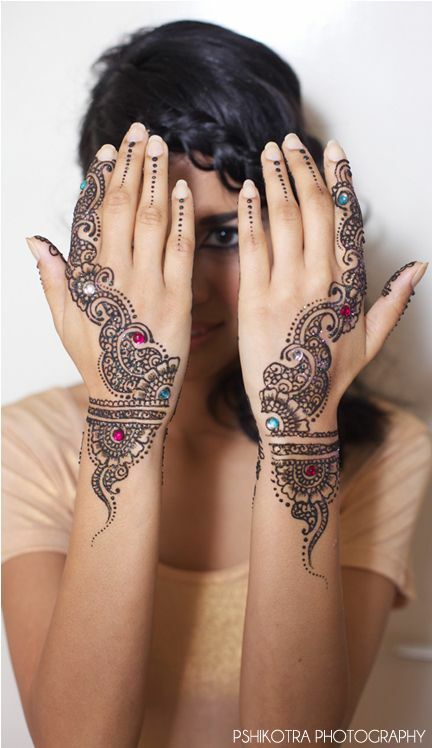 Who doesn’t love a beautiful and intricate mehendi design? The delicate lines and the aesthetic patterns are so pleasing to the eyes and are a fantastic way to highlight our traditions during important ceremonies. And now the latest craze is to add embellishments to the mehendi designs and make it sparkle and shine. What kind of embellishments are your favorite? Take a look through these amazing ornamental mehendi designs and let us know which ones you love. People are getting bold and brazen and experimenting with a variety of techniques to embellish their mehendi designs. From sparkles and glitter glue to stick on mehendi patterns and studs and sequins there is a lot to try on to get some stylish glamour on your hands. You can start by applying your basic mehendi design with the henna paste and then embellishing it with the elements of your choice. Or you could even choose to make a creative splash by drawing your entire mehendi with glitter and sparkles. With stick on mehendi patterns also available, the hassle of having to sit for hours during the application and waiting for it to dry can also be eliminated. And now the stick on patterns also come in gilded and sparkle patterns making it very easy to add some shimmer to your style. If your style is more simplistic but you still want to explore the embellishments without it looking too blingy, you can try experimenting with the studs and stones as well. These designs mostly involve adding smaller elements around an intricately drawn henna pattern of the mehendi just to add a beautiful sparkle without overshadowing the main design. The studs and stones are also usually a form of stick on application and can be easily applied and removed without any hassles. Just make sure you plan your mehendi design beforehand so you can leave the suitable space to add the stick on studs. 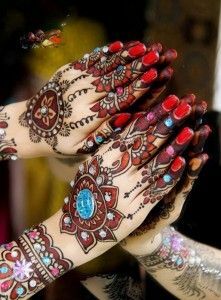 Many brides and bridesmaids are opting for the colored mehendi designs as well to match their outfits on the special day. You can color coordinate your clothes and let your mehendi artist know what kind of shades you will be wearing so she can plan your embellished mehendi accordingly. Some of the favorite colors this wedding season seem to be reds and blues. Get planning so you are on top of the latest trends with your outfits and your mehendi designs as well.